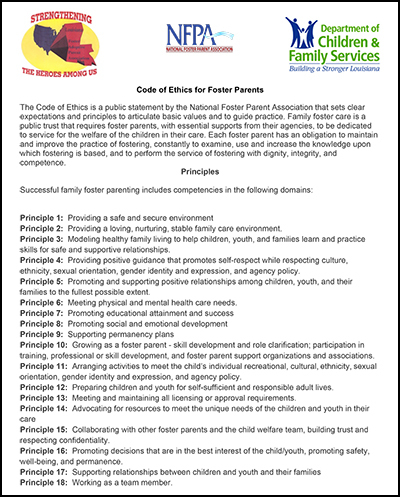 The Code of Ethics is a public statement by the National Foster Parent Association that sets clear expectations and principles to articulate basic values and to guide practice. Family foster care is a public trust that requires foster parents, with essential supports from their agencies, to be dedicated to service for the welfare of the children in their care. Each foster parent has an obligation to maintain and improve the practice of fostering, constantly to examine, use and increase the knowledge upon which fostering is based, and to perform the service of fostering with dignity, integrity, and competence.